CINCINNATI -- Camarra Randolph said she felt anxious and depressed after the election, but she knew she couldn’t just sit the bench. 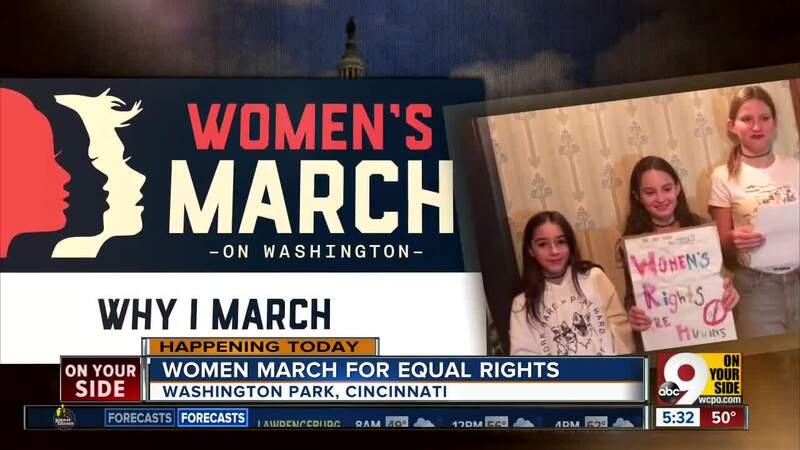 Randolph, along with thousands of people gathered Saturday at a rally and march at Washington Park in support of women's rights, civil rights and human rights, a local companion to the Women's March on Washington . “I didn't want to really leave the house because I was worried in the direction that our country was going, but I've got this three-year-old little girl, and she is going to be growing up in this world and so I know I need to stand up and make a change,” Randolph said. Just a few blocks away, others held their own prayer march over legalized abortion. 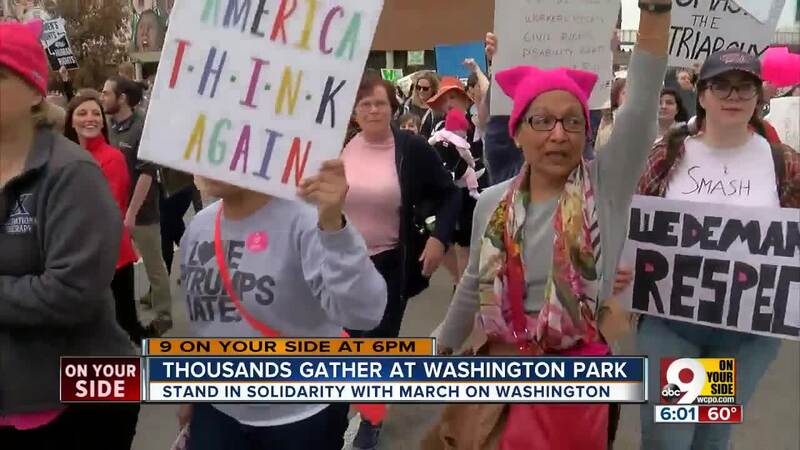 The Washington Park event was part of a nationwide Sister March movement after the election of President Donald Trump. Organizers in some 300 cities and 33 countries from Cincinnati to Berlin planned rallies and marches for the day after Trump took the oath of office. A grandmother in Hawaii came up with the idea after the 2016 presidential election. Representatives from Planned Parenthood, Women Helping Women, Black Lives Matter, the AMOS Project and the Islamic Center of Cincinnati spoke at Washington Park beginning at noon. From there, the crowd of thousands headed to Cincinnati City Hall. Allison Fischer was one of the thousands that marched to City Hall. "This has lifted my spirit and given me hope -- and makes me feel like I'm standing in solidarity with everyone,” Fischer said. Also in Downtown on Saturday, many marched from City Hall to Fountain Square as part of the 33rd annual Pro-Life Rosary Procession. The prayer march was held "in reparation for 55 million American babies killed by abortion since 1973 Roe vs. Wade Supreme Court decision," organizers wrote. Mimi Gingold, who traveled to Washington for the national Women's March, said the event was too important for her to miss . "I think the majority of people in America are good people who want to see rights and privileges we have earned and worked hard for over the years will continue," she said.